Mr. Jordan Waito of Kanata, Ontario, is the winner of the Carorcashforhealthcare raffle. Waito’s lucky ticket #00981 was drawn this evening at the Almonte Civitan Club Hall in front of a packed crowd. At final count, 6,476 tickets were in the draw for the joint fundraiser that benefitted both the Almonte General Hospital Fairview Manor Foundation and the Carleton Place & District Memorial Hospital Foundation. Waito has a choice to take the 1967 Pontiac Firebird convertible or $30,000 ca$h. 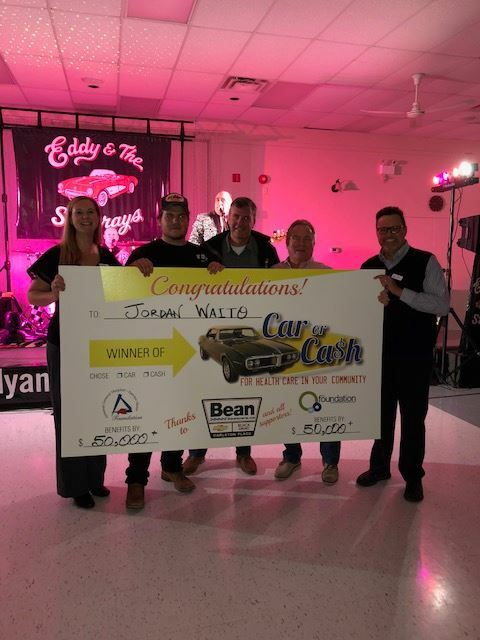 Keith Bean, owner and president of Bean Chevrolet Buick GMC in Carleton Place, donated the winning prize and was the one that drew the winning ticket. Carorcashforhealthcare raffle launched on April 6. Because the prize car was donated by Bean Chevrolet Buick GMC, all of the more than $100,000 generated, minus licensing fees, advertising costs etc., will be split evenly by the two hospital foundations. Dozens of volunteers sold tickets at local car shows, cruise nights, community and regional events, fairs and at Scotiabank in Carleton Place. Tickets were also sold by volunteers at the Almonte Hospital Gift Shop, by staff and volunteers at both hospital Foundations and by staff at Beans in Carleton Place. Thanks to Eddy and the Stingrays for creating a grand prize party for all those who attended.